Last week, I noted that today’s update would be a change to our Facebook and an announcement about our new title. Unfortunately, we’ve hit a delay and plan to update our Facebook in the Fall. In the meantime, we’ll continue with Argyle’s concept art, and a new task: the pilot episode script! With us drawing closer to the completion of our concept stage, I'm taking the opportunity of some extra free time to participate in a screenwriting class to write the pilot episode. A pilot episode is made on its own as a test for whether a show might work, and is sometimes also the first episode of a series. We're hoping to test out our animation methods, our characters, writing skills, and audience reception with this episode. We're hoping you, our readers and supporters, will enjoy it, and that others will take interest as well. We'll also be testing whether or not we can conceivably continue our project as an animated web series. 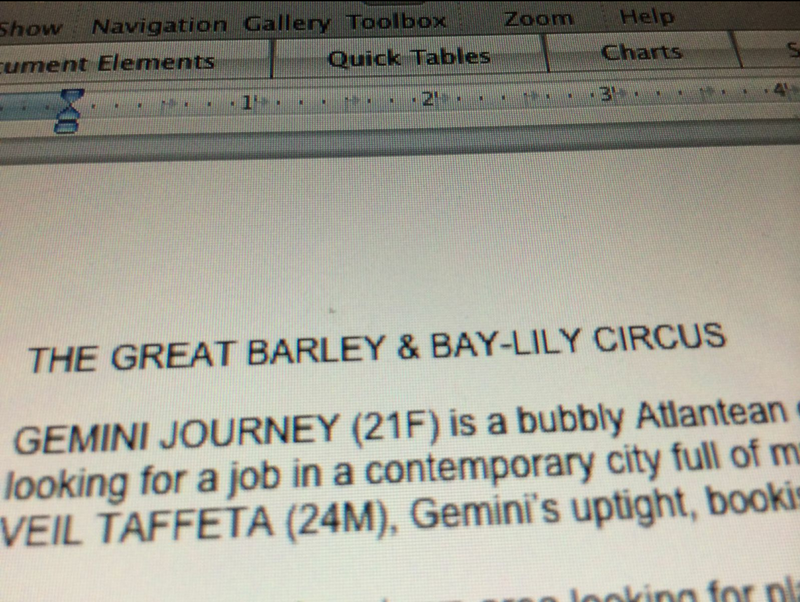 Gemini Journey, a bubbly Atlantean out on her own for the first time, is easily distracted from her job search, while her uptight roommate and elf friend, Veil Taffeta, is determined to keep her on track. When a mysterious circus comes to visit, Gemini jumps at the chance to ditch Veil and have some fun. However, she is so enchanted by the circus’s performance that she puts off her job hunting to come back again…and again…and again. What do you think about our pilot episode so far? Leave your thoughts in a comment below or contact us through facebook or tumblr! Thanks guys!